Robert Kushner’s exhibition at Carl Solway Gallery includes paintings from 2010 to the present, a small selection of prints and The Four Seasons, four large-scale paintings recently removed from Cincinnati’s Tower Place. The works feature his signature botanical subjects, often set against backgrounds of richly textured geometric patterns. 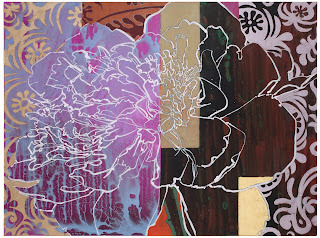 An early participant in the Pattern and Decoration Movement in the 1970s, Kushner continues to draw upon a wide range of influences including the decorative arts of Asian and Islamic cultures; such recognized Western artists as Henri Matisse, Georgia O’Keeffe and Pierre Bonnard; and Asian artists such as the 18th century Japanese painter, Jakuchu Ito, and Chinese painters, Wu Changshi (1844-1927) and Qi Baishi (1836-1957). In 1990, Robert Kushner was commissioned to create paintings for the atrium of Tower Place, the shopping mall adjacent to the Carew Tower. Completed in 1930, the Carew Tower is one of Cincinnati’s finest buildings from the Art Deco era. The mall was a busy center of downtown activity until many of the stores moved to the suburbs. The Tower Place building was recently sold and Carl Solway Gallery was able to rescue the four paintings, 9 feet by 27 feet each. Best known as a painter, Robert Kushner’s prolific artistic output encompasses large-scale murals for public and private spaces, installations, performances and costume designs for dance companies. In 2004, he installed two monumental mosaic murals titled Four Seasons Seasoned at the 77th Street and Lexington Avenue subway station in Manhattan. He recently completed an 80-foot long marble mosaic, Welcome, for the Raleigh Durham International Airport in North Carolina. Kushner’s most recent installation, Scriptorium, comprised of over 1000 drawings of flowers and plants on book pages dating from 1500 to 1920, has been exhibited internationally. Kushner’s work is included in many major public collections such as The Museum of Modern Art, New York; The Metropolitan Museum of Art, New York, The Whitney Museum of Art, New York; The National Gallery of Art, Washington, D.C.; The Philadelphia Museum of Art; J. Paul Getty Trust, Los Angeles; San Francisco Museum of Modern Art; Tate Gallery, London; Museum Ludwig, St. Petersburg, Russia and the Galleria degli Ufizzi, Florence, Italy. His work has been extensively exhibited since 1973 in the United States, Europe and Japan and was included in the Whitney Biennial three times (1975, 1981 and 1985) and the Venice Biennale twice. He was the subject of solo exhibitions at the Whitney Museum of American Art, the Brooklyn Museum and the Institute of Contemporary Art in Philadelphia. Born in Pasadena, California in 1949, Robert Kushner attended the University of California, San Diego. He was first active in the arts community of southern California and moved to New York City in the 1970s where, as a young artist, he supported himself as a restorer and collector of Oriental carpets. In addition to his artwork, Kushner has written many articles for art publications and, in 2006, edited Amy Goldin: Art in a Hairshirt, a collection of her writings. The late critic was an important professor and mentor to the artist. Eddie Huang has his official adidas Originals Collection set to debut in the beginning of October.For those that may not know who Eddie Huang is, he’s an American Yeezy Boost 350 restaurateur, chef, food personality, writer, and attorney. He owns BaoHaus, a Baozi restaurant in the East Village of Manhattan. He currently hosts ultra boost uncaged Huang’s World for Viceland.Shown here is a first look at the Huang’s World x adidas Originals Pack that includes slip-on sandals using Adidas Basketball Shoes the globe as inspiration. The other part of the pack is the adidas Superstars that are fully covered in Maroon.adidas Originals has Adidas Superstar confirmed on that Huang’s adidas Originals Collection will release on October 8th. We’ll keep you updated with the latest details as they Adidas Ultra Boost Uncaged develop. As part of the “KITHLAND” fashion show, Ronnie Fieg unveiled his forthcoming adidas Ultra Boost Mid.This latest iterations of the popular yeezy boost 350 adidas Ultra Boost features an extended ankle for a snug fit that’s constructed with the adidas Primeknit technology. Sporting a tonal Multicolor NMD Human Race upper and lacing, that’s contrasted with a crisp White heel counter, heel pull tab and Boost midsole and outsole.Ronnie Fieg has yet Adidas Pure Boost to unveil any official release information for his upcoming adidas Ultra Boost Mid. Check out the first look below and let us Yeezy Boost 350 V2 know what you guys think in the comments section.UPDATE: Check out the detailed images of Ronnie Fieg’s adidas Ultra Boost Mid below. yeezy shoes We’ll keep you updated on a release date once it’s announced. Images via: sneakerprophet_.